LipsNLotions... these are the type of things that come to mind as we start into the Fall season! 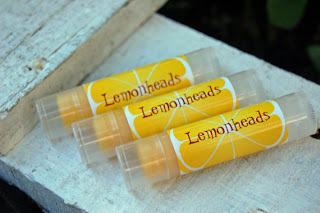 Dry lips and skin are upon us shortly and we need to gear up with lip balms and lotions. LipsNLotions is a beautiful Etsy site with all hand made skin care items. Monica uses gourmet bees wax in her products for a rich, moisturizing feel. She has a unique group of lipbalms to go along with the 'regular' scents. I just had to try Bacon, as my 14 year old uses the word in just about every sentence. It does indeed smell like bacon! No chance of anyone thinking that this lipbalm is 'girlie'. Other unique scents are Popcorn, Pizza and Dill Pickle! 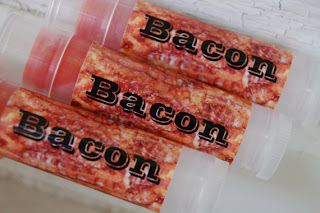 Great idea for your boys when they don't want to use lipbalm, but they really do need it! Pull out their Dill Pickle lipbalm and they will get lots of attention. I really loved the Lemonhead version that I tried. A little more on the 'normal' side, I don't mind smelling lemony fresh. The lipbalm was very moisturizing, and didn't burn my lips. Have you ever had lip balm that actually made your lips feel worse? I sure have, so it is important to me to let you know the little details like that. It goes on smooth and moisturizes just like it should! Fantastic combination for moisturizing, long lasting, shine! I also was able to review one of her lotion bars. 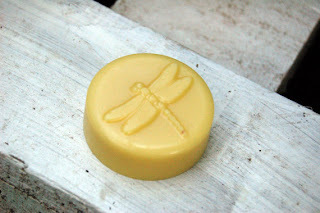 I LOVE lotion bars and I think it goes back in the day I had time to make them myself. I love how handy they are to carry in your purse in the tin, and to use on those really dry areas like heels, knees, and elbows. Love her dragonfly emblem on top of the lotion bars. These come in a variety of scents! Dragon Fire, Vanilla, Bamboo Sugar, Purple Cow and more. Again you can get a traditional scent or one that is a little off the beaten path! 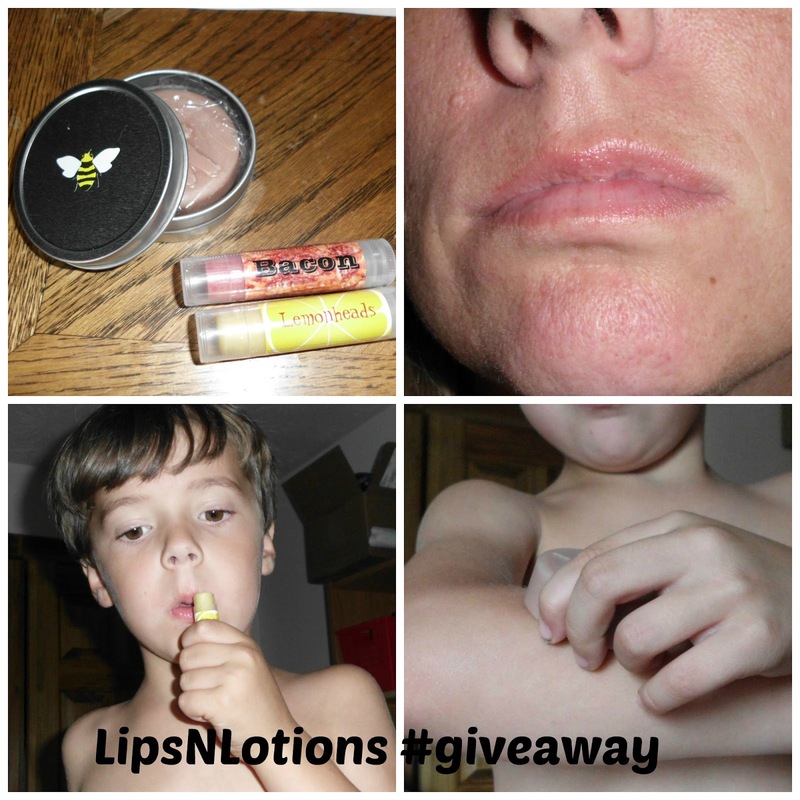 Want to win your choice of lipbalm and lotion bar?? Enter using the Giveaway Tools below! Be sure to check out LipsNLotions on Facebook! I would like the Purple Cow lotion and the French Toast lipbalm. Thank you. The lemon head. Thank you for the giveaway! Toasted Marshmallow lip balm & Eucalyptus lotion bar. Thank you for the fantastic giveaway! I'm leaning toward the Lavender Vanilla lip balm and the Like Moonlight Path lotion bar... but it's so hard to choose! I would pick Pumpkin Cheesecake lip balm and Vanilla Almond lotion. Man, I had a hard time narrowing it down since she has some really good scents/flavors. My choice is French Toast lip balm and Purple Cow lotion. I would like the French Vanilla lipbalm and the Apple Rose lotion bar. I would choose the Pumpkin Cheesecake and the Lilac lotion. I would pick Toasted Marshmallow lip balm and Purple Cow Lotion Bar.